The race on the Belle Isle circuit was touted as a major deal with the open wheel racing series’ returning engine supplier Chevrolet sponsoring the ‘motor city’ event. The Chevrolet Detroit Belle Isle Grand Prix was granted the special honour of being the race that followed the Indianapolis 500 on the 2012 IZOD INDYCAR Series calendar. With many minds still recalling the 96th race at the Brickyard fondly, the 2.07-mile street course in the state of Michigan one week later served as restart point for the 2012 open wheel racing season. In Saturday qualifying the #9 Target Chip Ganassi Racing car of Scott Dixon broke the pole position dominance that Team Penske held throughout the 2012 season up to the Chevrolet Detroit Belle Isle Grand Prix. Only the three IZOD INDYCAR Series event of the season where Honda was able to make use of a more powerful turbocharger unit, the engine is coming off of a momentous Indy 500 win powering Dario Franchitti‘s Target Chip Ganassi entry. Will Power qualified 2nd quickest as the highest Team Penske car intent to allow their Chevy engines capture the Chevrolet-sponsored event. As cars took off through the warm-up laps of the Chevrolet Detroit Belle Isle Grand Prix, the 3rd place starting #98 Bryan Herta Autosport machine of Canadian driver Alex Tagliani would not start. This race was the second race of 2012 where the Bryan Herta Autosport team were utilizing Honda power rather than the Lotus engine they ran for the first 3 IZOD INDYCAR Series events of 2012. The #98 car was able to restart but lost its prime starting spot as the scheduled 90-lap street race were sent to green. Besides, Tagliani, there was also early race troubles for the #18 Dale Coyne Racing car piloted by Justin Wilson. On the first lap, Wilson slid and made side contact with concrete barrier out of a turn. While Justin Wilson remained in the race for 28 more laps, the Dale Coyne-owned car was retired based on mechanical issues pertaining to the crash damage finishing 22nd. James Jakes, Sebastian Bourdais and Rubens Barrichello were also early retirements from the Chevrolet Detroit Belle Isle Grand Prix by the time the race‘s first pit stops were taking place. From pole, Scott Dixon was having an opportune race leading all the early laps of the Detroit IZOD INDYCAR event up to the pit stop cycle. Thanks to a comfortable lead and other lead cars pitting, Dixon’s #9 car left his Target Chip Ganassi Racing pit crew still holding the race lead as he returned to competition. While passing wasn’t impossible on the Belle Isle track, the pace of leaders gave few teams an chance to challenge the New Zealand driver Dixon. There was also a number of accusations that 5th place starting EJ Viso’s slower race pace divided the field. An event composing of 40 laps of green flag racing, the 2012 Chevrolet Detroit Belle Isle Grand Prix’s first caution resulted from two incidents on track caused by a deterioration of the race surface. 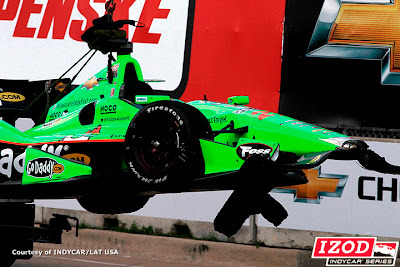 While almost every driver on the course were realizing sizeable pieces of asphalt flying from the Belle Isle track, it wasn’t until the #27 GoDaddy.com car of James Hinchcliffe sailing hard into the tire barrier of turn 7 that a problem presented itself to everyone observing the spectacle. In addition to Hinchcliffe, the Rahal Letterman Lanigan Racing #15 car of Takuma Sato was also bit by a decaying track in turn 12. After retiring from his first 2012 IZOD INDYCAR Series race, James Hinchcliffe commented "It was like Russian Roulette and I just pulled the bullet." Given a choice to run the race under caution to 45 and calling the event as official, the IZOD INDYCAR Series official elected instead to give track repairs an opportunity to patch up the sections of the Belle Isle street. More than 2 hours and 15 minutes of red flag to replace the defective parts of the Belle Isle track, the event would continue without further interruptions from the surface. The remaining IZOD INDYCAR drivers were sent back out on the course to receive green for a reduced race distance of 60 laps (turn from 90). There were two full course yellows the slowed the Chevrolet Detroit Belle Isle Grand Prix in the final 15-lap dash.. On lap 47, an incident involving Helio Castroneves spinning out on a slick turn 6 that also collected the #20 car of Ed Carpenter. The #67 car of Josef Newgarden had spun out during this caution after receiving contact from another car. The race’s final caution flew as a result of a turn-5 incident involving KV Racing Technology driver EJ Viso and the #26 car of Marco Andretti. The final caution period came at lap 52 giving the field one more chance to chase race leader Scott Dixon. 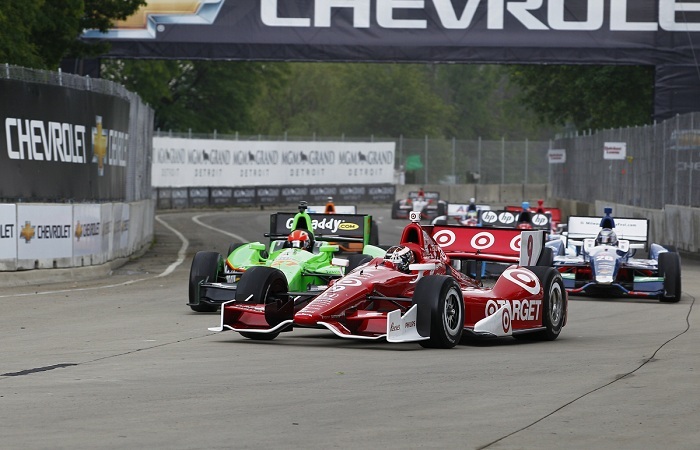 The extended break in the 2012 Detroit Grand Prix did little to upset the rhythm of the leader Scott Dixon. Through the final 15 laps, the #9 Target Chip Ganassi Racing car kept his teammate Dario Franchitti in his rearview mirrors on route to his first victory of 2012. A dominant performance where the New Zealand driver led flag-to-flag in the shortened Detroit race, Dixon’s first victory comes after finishing three times in the runner-up position in this year’s events. “If I could have gotten my gloves off I'd have chewed my nails for sure on those final laps. I'd like to give a lot of credit to everyone at INDYCAR and the Detroit staff for getting the track back in shape so we could race. The final 15 lap shoot-out was exciting for me - so I sure hope the fans liked it.” said Scott Dixon. 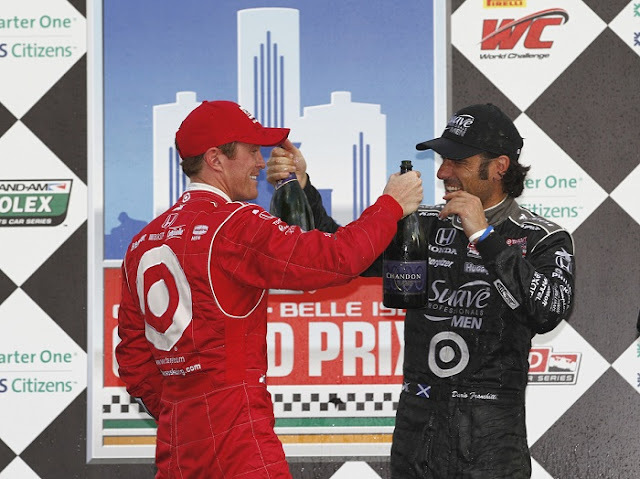 Even a final chance 7 laps to go wasn’t enough for Dario Franchitti to follow-up his Indy 500 win with a victory on the streets of Belle Isle. Still a solid effort based on the start of the 2012 season, Franchitti in 4th place in IZOD INDYCAR Series overall driver points. In post-race, Dario Franchitti responded, "I thought in the first couple of laps I had a chance, but I couldn't, he was too quick. And with our car breaking the front wing early on, the more the run went on, the more understeer it got. But that's not to take anything away from the job Dixie did, and a 1-2 for Team Target after his brilliant qualifying and my abysmal one, we'll take it." Franchitti and the #10 car came from a 14th place starting spot to 2nd at the end of 60 laps. 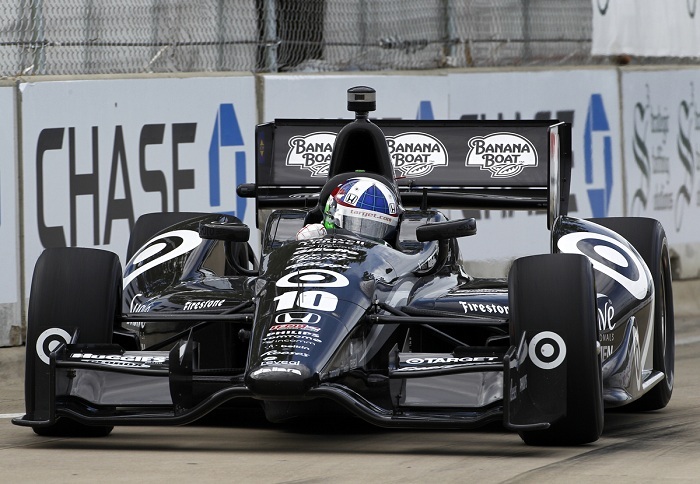 Aside from the two Target Chip Ganassi Racing cars powered by Honda engines, rookie driver for Schmidt-Hamilton Motorsports Simon Pagenaud allowed the Japanese auto company to own the podium for the Chevrolet-sponsored Detroit street race. 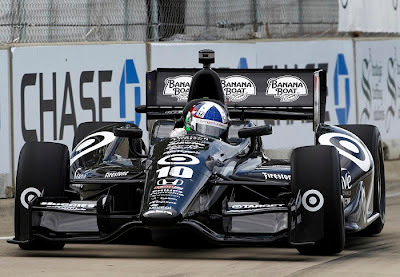 Chevrolet’s top finisher in the Chevrolet Detroit Belle Isle Grand Prix was Australian Will Power in 4th. Leading the overall driver points standing by 26 points over Scott Dixon, Power and the Team Penske group are starting to feel a much stronger challenge from old rival Target Chip Ganassi Racing as 2012 progresses. After a quiet but effective effort at Indianapolis that resulted in a 4th place finish in the 500-miler, Oriol Servia and the #22 Dreyer & Reinbold Racing team continues to impress with their new Bowtie engine at Detroit. With a 5th place result, Servia finished ahead of multiple car team Chevrolet contenders KV Racing Technology (Tony Kanaan in 6th) and Andretti Autosport (Ryan Hunter-Reay in 7th). Worthy of honourable mention, Alex Tagliani and the #98 Bryan Herta Autosport team didn’t give up after their early race setback. After starting deep in the field, Tagliani managed to break into the top-10 during the final race restart. The 10th place is the first top-10 for the former Lotus-powered entry in 2012. The only Lotus-engined car on the IZOD INDYCAR Series grid throughout the 2012 season, HVM Racing’s #78 car driven by Simona de Silvestro took a respectable 13th place from the Detroit event. On Saturday night, the 2012 IZOD INDYCAR Series will participate in their second oval race of the season at Texas Motor Speedway.